Feeding your baby (and the planning, cleaning, storage) of either breast milk or formula or both is a daily headline in your role as a new mother. In recent months, the topic breastfeeding has also made media headlines. Mom and supermodel Gisele Bundchen posted a photograph of herself breastfeeding her daughter while her beauty team made her camera ready for a shoot. The photo stirred some controversy. The international group, the La Leche League, praised her as a working mom also making good nutritional choices for her baby. Others took offense criticizing her for exposing her baby during what should be a private event. I applaud Gisele for showing that women should have the flexibility to nurse in public and multi-task! However, for most women nursing is NOT all the glamour Gisele portrayed. Nursing often takes place in PJs without makeup or hair stylists. And breast pumping is even less glamorous. Many women return to the workforce and continue breastfeeding and pumping which requires much personal time, commitment and a supportive office. (Breast pumps are often covered by standard health insurance. I would recommend a hands-free electric pump with soft breast cups that you can tote to/from work, social events or the airport.) In public, many moms choose nursing covers to be discreet and protect their privacy. But there is no law against breastfeeding in public. Be sure to consume at least 1000 mg of calcium and adequate vitamin D in food or supplement form daily while nursing to prevent future osteoporosis or bone loss. The truth is breastfeeding comes naturally for some while others struggle with latching or supply. If you are struggling with early nursing issues, don’t wait. Reach out to a trained lactation consultant or elicit advice from seasoned mamas. Often lactation groups in your neighborhood or local hospitals offer classes. As nursing progresses and your baby finds the outside world more exciting than your breast or teeth appear (ouch!) allow more time and patience with nursing. I found the book The Nursing Mother’s companion, 6th edition by Kathleen Huggins, RN a great reference. Supplements such as fenugreek have anecdotally increased mother’s milk supply, however there are no scientific studies to validate this claim and herbal supplements are not well regulated by the Federal Drug Administration (FDA.) I found adding in a pumping session at night before bed, staying hydrated and keeping stress at minimum allowed me to keep my milk supply adequate. If you cannot nurse or have no alternative, formula becomes your baby’s primary source of nutrition. “Breast is best” however, formula can be an excellent option or even a necessity for some moms. This was the case for a mother I met who carried the BRCA mutation for hereditary breast cancer and underwent a bilateral mastectomy at age 28 for stage 1 breast cancer. If your baby isn’t meeting weight goals or has a lactose allergy, some pediatricians recommend supplementing with formula. Sometimes some medical conditions or medicines are contraindicated for breastfeeding. Some moms have to get uninterrupted sleep and need someone else to feed the baby with formula at night. Don’t criticize yourself for not fulfilling your ideal of 12 months of breastfeeding. Instead, focus on growing and bonding with your healthy baby. As I mentioned in my last blog post, as a new mother YOU make the rules for your family. Whether you breastfeed, formula feed or a combination of two, please congratulate yourself on making the best nutritional choice for your baby and remember to allow time for a snuggle afterwards! 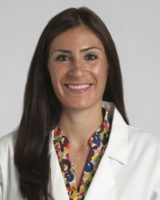 - Kristi Tough DeSapri, M.D.